"I have the right to my own views. What you do in your books and on your website is to judge others because you do not agree with them. This is outrageous". From the legal or juridical point of view, you have the right to do everything you want with Amida Dharma. This is because we are fortunate to live in countries where freedom of speech is guaranteed. But from the moral and Buddhist point of view, you do not have the right to change Amida Dharma, and the reason for this is very simple - you are not a Buddha. As a priest and teacher you do not have rights, but responsabilities toward the Amida Dharma and sentient beings who come in contact with it. This is not a matter of you and me agreeing with each other. The sangha is not a social club, but a place where we should be in harmony with the Dharma. Please bear this in mind. Recently, I have been reflecting on my not having shinjin. The problem is I don't know WHY. Any blocks or obstacles to my receiving of Amida's gift of shinjin must be unconscious as I don't have any conscious obstacles at all. Have you ever wondered that perhaps you complicate your mind? I mean what do you want this shinjin to be, that you stress your mind about it, so much? It is especially because people tend to complicate their minds and think that shinjin must be this or that thing, that I wrote the article, Faith is simple, nothing special. Perhaps your mind still thinks that something must happen when you entrust to Amida, or is waiting for something to happen when you have faith. Dear friend, you will NOT change a bit after entrusting yourself to Amida. You are not supposed to constantly feel anything special if you entrust to Amida. There is really nothing there if you entrust to Amida, except a simple faith and Amida who helps you – assures you of your birth in His Pure Land. If I am in the Pure Land created by Amida Buddha's Perfect Will Power after I die, what would happen if I never get enlightened? Is there a time limit to attain Enlightenment in the Pure Land? I’m scared as I don't want to experience birth, age and death anymore. 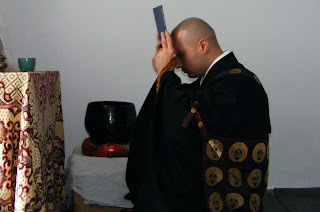 Some time ago I was in correspondence with a drug addict who showed great interest in the Jodo Shinshu teaching. He had a hard time trying again and again to give up taking drugs but he always returned to his bad habit. More than this, he was afraid that he cannot be saved by Amida as he is. Just entrust to Amida Buddha as you are. If you can abstain, and is useful to try, this would be good for your health, but if you cannot, don’t worry. Jodo Shinshu is especially for people who cannot abstain, who are incapable of any practice, for those that any advice or any treatment is useless, for people whose minds are too sick to recover from their problems, anxieties, and deviations. Its not that they especially want to be like this, but their habitual karma is too strong for them to overcome. After many years and even many lives of taking the drugs of ignorance and blind passions how can one think and act like a normal person? How can one practice Buddhism and become a Buddha by himself? I met many times with alcoholics and told them the same if they asked me questions on Buddhism. If you tried and cannot give up, then be an alcoholic who entrusts to Amida. Be an alcoholic or drug addict nembutsu follower. Be a bad Buddhist who entrusts to Amida. Jodo Shinshu is the path for sick people, for those without hope. Its the path for alcoholics, drug addicts, and all kind of people with strong attachments. 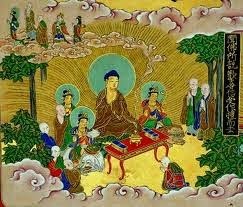 All are equally accepted by the Compassion and Primal Vow of Amida Buddha. So please, come as you are. Your salvation is in Amida's hands, not yours. 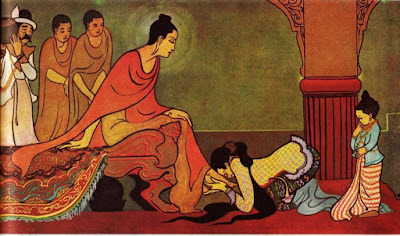 You can try to cure yourself of any addiction you have, but do NOT postpone taking refuge in Amida Buddha until you become ready, or clean or worthy... You are saved not because you "deserve", but because Amida loves you unconditionally. Question: I found the expression “good men and women” in a passage from the Smaller Amida Sutra. Should I become a “good man” in order to be born in the Pure Land? I am not a scholar, so please give me a simple answer, without entering into difficult details. "Sariputra, those who have already aspired, now aspire, or in the future will aspire to be born in the land of Amida Buddha all dwell in the stage of non-retrogression for realizing highest, perfect Enlightenment. They have already being born, are now being born, or will be born in that land. Hence, Sariputra, good men and women of faith should aspire to birth there." "Men and women of faith” are called "good", not because they must be virtuous as a necessity for birth in the Pure Land, but because they are given Amida’s perfect virtues through faith. In other words, Amida makes them good (suitable) for birth in the Pure Land, that is, he provides them with all that is necessary for rebirth there. So, “faith” (shinjin) is the implicit meaning and the essence of this passage. Without reliance on Amida’s Power, one cannot go to the Pure Land because his/her “goodness” or personal virtues are simply not enough for such a goal. But if men and women entrust in Amida Buddha, they “dwell in the stage of non-retrogression” in this life, and at the moment of death they are reborn in the Pure Land, where they attain the “highest, perfect Enlightenment”. Thus, instead of struggling yourself to become worthy of the Pure Land, you should simply entrust to Amida and let him carry you there. What is the meaning of faith and nembutsu? Question: Why are we urged to aspire to birth in the Pure Land, and why not try to attain Enlightenment here, in this world? Answer: The environment in which we now live is the product of our karma and the inter-related karma of all beings. This impure common karma gave rise to an impure environment which also influences us and in which it is hard to have a true spiritual evolution. We ourselves are sick, our fellow beings are sick and the environment is also sick. This is why we are urged to aspire to be born after death, in the Pure Land. This land is the healthy enlightened realm of Amida, a suitable environment which is not the product of evil karma but of His pure karmic merits. Once born in such a sane environment our insanity is cured instantly, our delusions are naturally melt like ice meeting fire, and our true enlightened nature will appear. What do I mean by "modern heresies"
Question: You often use the term "modern heresies" and equate these with slandering the Amida Dharma. Please explain in a few words what do you mean by it. My answer: To deny the authenticity of the Pure Land sutras and the existence of Amida Buddha by calling Him a metaphor, symbol, fictional character or anything else than a real and living Buddha, to say that His Pure Land is in one’s mind, denying that birth in the Pure Land takes place after death, or mixing Amida Dharma with various non-Buddhist philosophies and worldly ideologies – this is what I call slandering the Dharma, becoming an enemy of the Dharma and cutting the root of the Dharma in one’s heart. Answer: In order to show that Amida’s Pure Land is not a metaphor, but a real place in which people can actually aspire to be born after death, the land is given a direction and is described in great details in the sutras. Some say that the direction „west” and the marvelous descriptions of the Pure Land are a proof for its non-existence or for its existence as a symbol or metaphor only. But the truth is that by making the effort to describe in many words the wonders of the Pure Land and by pointing to a direction where to face the Pure Land when worshipping Amida, Shakyamuni Buddha wants to emphasize its actual existence as a place where sentient beings should aspire to be born without worry and doubt. It is like I speak to you about a beautiful park which I would like you to visit. If I tell you, „its there, in the west of the town” and I start describing it to you, then you will have no doubt about its existence and you will wish to see it. Its the same with the expression „Pure Land of the West”. 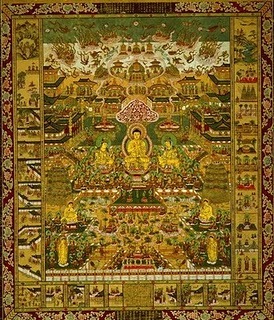 The exaltation with which Shakyamuni describes the Pure Land of Amida in the Smaller Amida Sutra (Amida-kyo) without even being asked to do it, or the radiant light that emanated from his body when he delivered the Larger Sutra in which he expounded the story of Amida and his 48th vows, are both an indication that his words were true and his listeners should accept Amida as a living Buddha and his Pure Land as a real place. 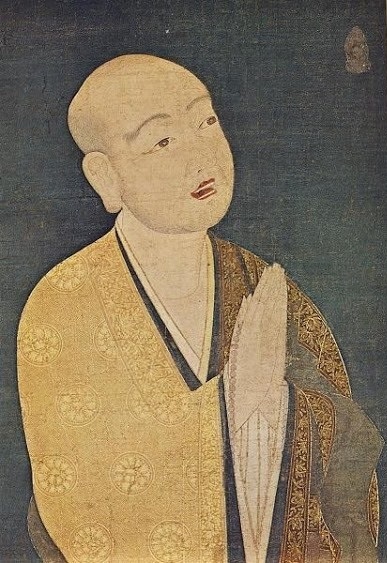 The Smaller Amida Sutra (Amida-kyo) is a sutra spontaneously delivered, not in response to a question, which is a proof of the importance of the teaching about Amida Buddha. 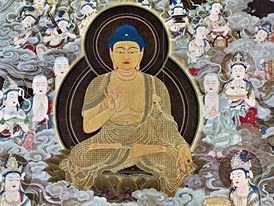 In this discourse, Shakyamuni begins every description with great enthusiam, repeating the name of his main listener, Shariputra, telling him the wonders of the Pure Land and the uniqueness of Amida Buddha among all Buddhas. It is recorded in the Larger Sutra on Amida Buddha that when Shakyamuni was about to deliver it“all the senses of the World-Honored One radiated joy, his entire body appeared serene and glorious, and his august countenance looked most majestic.” After Ananda asks him which is the reason of these wonderful manifestations, Shakyamuni reveals to him the true goal of his coming to this world, by presenting the story of Amida Buddha, the 48th Vows and encouraging sentient beings to aspire for birth in the Pure Land. In the same sutra, the whole gathering listening to the discourse, including Ananda, had a vision with Amida Buddha and his Pure Land, which is another proof that Shakyamuni speaks about real things, not symbols or fictions. “Quite often it seems that we want it both ways........'our power' and Other Power. Could we think about it this way, 'self-power' is an illusion that exists within Other Power, and even this illusion cannot obstruct the nembutsu ? I think we should not complicate our minds. To rely on your own power cannot lead you to Buddhahood in the Pure Land. It’s as simple as that. To rely on your own power will obstruct the nembutsu and your birth in the Pure Land. In the true Other Power faith there is no trace of self power. You rely on Amida Buddha or not. Mixed faith is not true faith. When it is said in the sacred texts that nothing obstructs the nembutsu this means that no matter how heavy your karma, you are saved by Amida if you fully entrust in him. In this sense, your illusions or blind passions cannot be an obstacle to the nembutsu. But self power simply means that you do not rely at all or not exclusively on Amida for your attainment of Buddhahood in the Pure Land. This is why self power is an obstacle for the nembutsu, because in reality, the vehicle that takes you to the Pure Land is Amida’s Power, not your own power. We also have to understand clearly the meaning of the terms “self power” (jiriki) and “Other power”(Tariki). They are related only with the ultimate goal of becoming a Buddha in the Pure Land. They have nothing to do with our daily activities related with work, family, health, business, etc. In everyday life one can make efforts to be successful, to be a good husband, a good doctor, a good engineer or teacher, etc, but in matters related with Buddhahood one should rely only on Amida Buddha and on nobody else, especially not on himself. To become a Buddha is the problem of Amida, not yours. Can "worldly Way" actually assist us in realizing shinjin, by making clear to us that we are unable to help ourselves reach Nirvana, Enlightenment, and the Pure Land ? I do not know if I understand correctly what you mean by “worldly way”, but into my opinion, everything can teach us important lessons if our minds are ready. When one is ready to learn, everything becomes a teacher and a guide.